Join us for our 5th Annual Alpine Bank River Clean Up on October 20th, from 9am to Noon. Show up at 9am at Lions Pond in Rifle to register, spend the morning cleaning up the morning with the community, and then have a lunch on us and (hopefully) win a door prize! No pre-registration is required, just show up with some sunscreen and a water bottle; we’ll provide the gloves and trash bags. Mark your calendars and spread the word! Calling all volunteers! Lions Ponds at the CDOT Rest Area is a great location that many people enjoy recreating at for fishing, picnicking, and dog-walking. It is also the future site of a water-centric interpretive center. There are a number of growing cottonwoods that have been getting chewed by beavers in recent years. In order to increase wildlife habitat, the number of shady places for recreation, and the beauty of the area, we would like your help in protecting the cottonwood trees that are left! When: September 20th, 4:30pm to dusk. Feel free to come whenever you are available! Lions Pond (on the far side of I-70 and the Colorado) from the air. -Chris Treese, External Affairs Manager for the Colorado River Water Conservation District, will talk on water rights and water law at the Shoshone Power Plant. Registration is $10, and space is limited. Bicycles, helmets, and the shuttle up-canyon to the start of our downhill ride are all provided. We are meeting at 8:30am at 723 Cooper Ave, Glenwood Springs, CO 81601 for a 9am departure. Please park at the parking garage at 9th and Cooper; there likely won’t be space in the small lot by Glenwood Adventure Company. Thanks for signing up to join us on our Watershed by Bike Tour on Saturday, September 15th! We're really excited for the event, and we wanted to send along a couple of details to ensure it is enjoyable and goes smoothly. -Glenwood Adventure Company is providing bikes and helmets. If you would like to bring your own helmet, you are more than welcome to. -It is about a 13 mile ride from Bair Ranch to Glenwood Springs. We plan to be back in Glenwood around lunchtime. Bring some water (about 2 quarts) and some snacks for the morning, a jacket, gloves, and hat to fight off the morning chill and breeze in the canyon, some sunscreen for the 'sunny' forecast, and a small pack to put it all in. -We are meeting at Glenwood Adventure Company (723 Cooper Ave, Glenwood Springs, CO 81601) at 8:30am to sign some waivers, gather helmets, and be rolling out of there by 9:00am at the latest, so we don't throw off GAC's shuttle schedule for the day. Please park in the parking garage at 9th and Cooper; GAC has a small lot on Cooper that won't have available parking. Feel free to email me at any time with questions at jon@midcowatershed.org, and don't hesitate to call at 717-283-8323 on Friday afternoon or Saturday morning with questions as well. In addition, as of now we still do have seats open; please spread the word! Thank you again for joining us for a fun and beautiful morning of bicycle riding and water education, and we'll see you soon! After clicking 'add to cart' and filling out the form, you must check out and purchase the registration in order to secure your spot. To do so, scroll up to the top of this page and look for the black button denoting your checkout total. Click this and follow the payment instructions to checkout and secure your spot on the Watershed by Bike tour! For nearly ten years, the Middle Colorado Watershed Council has worked to increase the appreciation of the natural resource that our region relies upon. The Colorado River is the backbone of lifestyle and economy where we do our work, from the head of Glenwood Canyon to DeBeque. The river, and others feeding into it, fuels our local agricultural and recreational businesses, and it provides riparian habitat for a diverse array of wildlife. In the spring of 2017, the MCWC moved into the office and visitor information space at Lions Park in Rifle at the I-70 rest stop, courtesy of the City of Rifle. Half of that space constitutes our office, and the other half has remained empty since the regional brochures and information were removed years ago. At once, we began to secure funding for turning that empty space into a Colorado River Interpretive Center, and now we have the initial funds to begin designing and planning that space to be a place of learning and education of the Colorado River in Rifle. We’ve contacted a dozen of interpretive centers and museums across the West to understand how they began their work. We have contracted Wild Rose Education, a leader in watershed education and educator training, to work with us as an Interpretive Planner, facilitating two public input meetings to determine what themes and topics will be included in this relatively small space. Our first meeting on August 7th was to collect your input. Our second meeting, on August 29th, will be an opportunity for Wild Rose Education to report back with the Draft Interpretive Plan, requesting further input. Following this phase, an Interpretive Designer will be contracted to visually design and create the material, at which point the desk will be staffed with a part-time docent and the doors will open to the community, school groups, folks coming in for a brief reprieve of the highway, and anyone else who comes on over. We’re writing to you to ask for your help in this initial content-determining phase. Please join us on Wednesday, August 29th to share your thoughts on what you want to experience when you visit a river-centric interpretive center, so that we can put it into ours. We need your input to ensure that this community and regional resource is well-used and long-lived, and we need input from all aspects of our diverse community to make this happen. Our second and final public input meeting will be at 6:00PM on Wednesday, August 29th in the Rifle Public Library’s Community Room, and a light supper will be provided. Thank you for joining in with a community that wants to share its appreciation of rivers. Please email jon@midcowatershed.org if you have any questions. We’ve contacted a dozen of interpretive centers and museums across the West to understand how they began their work. We have contracted Wild Rose Education, a leader in watershed education and educator training, to work with us as an Interpretive Planner, facilitating two public input meetings to determine what themes and topics will be included in this relatively small space. The first meeting will be to collect your input and the second meeting will be an opportunity for Wild Rose Education to report back with the Draft Interpretive Plan, requesting further input. Following this phase, an Interpretive Designer will be contracted to visually design and create the material, at which point the desk will be staffed with a part-time docent and the doors will open to the community, school groups, folks coming in for a brief reprieve of the highway, and anyone else who comes on over. We’re writing to you to ask for your help in this initial content-determining phase. Please join us at both of our public input meetings to share your thoughts on what you want to experience when you visit a river-centric interpretive center, so that we can put it into ours. We need your input to ensure that this community and regional resource is well-used and long-lived, and we need input from all aspects of our diverse community to make this happen. Our public input meeting will be at 6:00PM on Tuesday, August 7th and the follow up meeting will be at 6:00PM on Wednesday, August 29th. Both meetings will be at the Rifle Public Library’s Community Room, and a light supper will be provided. The Middle Colorado Watershed Council is once again sponsoring the 2018 Glenwood Springs RiverFEST! Not only will we be there enforce and have an informational booth after lunch, but we'll also be having a super clean up team once again. 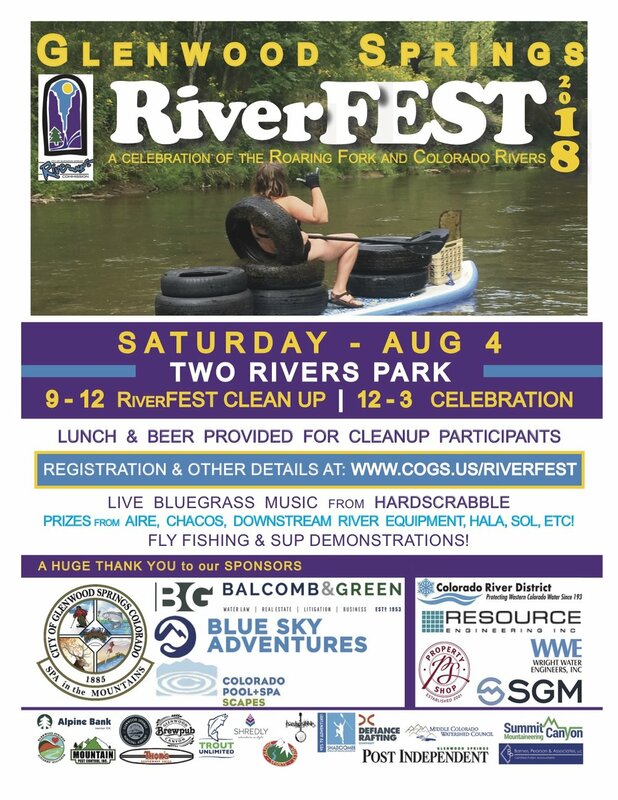 To join the Middle Colorado Watershed Council clean up team, organizing under one banner for watershed health for all, visit RiverFEST's eventbrite page, and click 'register' (free), click 'team'. Type in 'Middle Colorado Watershed Council' for the team name, and then type in 'mcwc' for the team password, then finish off your registration as normal. Join the Middle Colorado Watershed Council on a Cross-Watershed Network Event. On June 21st, we will hop on a bus and tour riverfront site projects along the Colorado River from Glenwood Springs to De Beque with local officials, river restoration professionals, and you! Registration is open on a first-come, first-serve basis and it does have a maximum number capped. Throughout the day, we'll visit potential restoration sites, fostering visions for projects throughout the watershed. In between stops, leaders of local and regional organizations will speak on a variety of topics that are important in our water world. Registration is $15, which provides lunch and transportation in between field sites. The Middle Colorado Watershed Council and the Colorado River Water Conservation District are hosting the Middle Colorado State of the River, a free annual public informational meeting. Come and learn about the state of your river and ongoing projects and initiatives to increase its health and the awareness of its importance at this public informational event. Hosted at the Ute Theater in Rifle, it is free to attend, with refreshments served at 5:30PM and the presentations starting at 6PM, running until 8PM. If you cannot make it out to the Ute, the event will be live-streamed on our Facebook page! 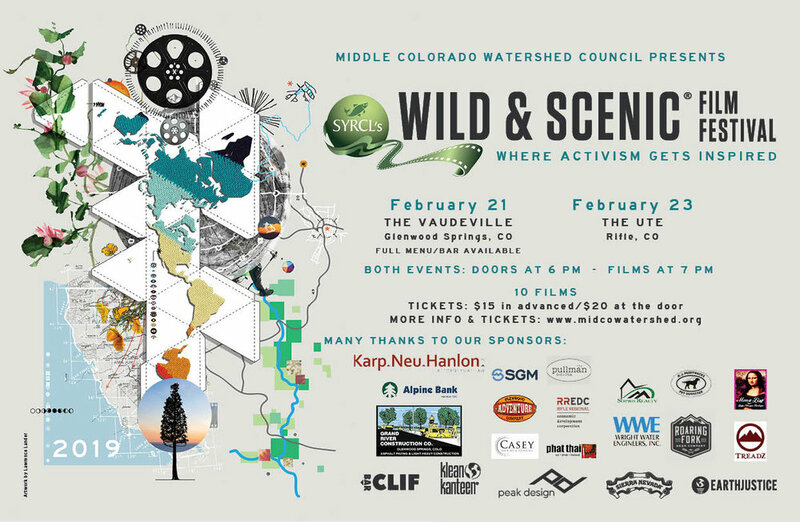 The Middle Colorado Watershed Council is hosting a free screening of the movie The Great Divide. Join us at 6:30PM at the Rifle Public Library on Tuesday, May 8th! While the library closes at 6:00PM, doors will be open for the event from 6:00PM to 6:30PM. However, it is completely fine if you cannot make it to the film on time; a phone number will be posted on the front door of the library for you to call so that we can come down and let you in! Tens of millions of people, billions of dollars of agricultural production, and an enormous amount of economic activity across a vast swath of America from California to the Mississippi River are all dependent on rivers born in the mountains of Colorado. In a time of mounting demand and limited supply, the need for all citizens to better understand and participate in decisions affecting this critical resource is paramount. The Great Divide, a feature length documentary film from the Emmy award winning team of Havey Productions, in association with Colorado Humanities, illustrates the timeless influence of water in both connecting and dividing an arid state and region. From Ancient Puebloan cultures and the gold rush origins of Colorado water law to agriculture, dams, diversions and conservation; the film reveals today’s critical need to cross “the great divide,” replacing conflict with cooperation. Join Roaring Fork Outdoor Volunteers for a project on the Silt River Preserve! Join the Mount Sopris, Bookcliff, and South Side Conservation Districts for a free informational event to learn how to manage your natural resources during a drought. For more information and to RSVP, please visit their website. RiversEdge West is hosting an evening with river photographer Tim Palmer in Grand Junction. It is free to attend, and you can RSVP for a free beer or soda. Click here for more information.